Though most of the rebels in Syria are Sunni Muslims, many of them hope to establish a secular democracy with representation for all Syrians. Al-Nusra and ISIS, on the other hand, base their entire organizations around a violent extremist religious ideology. Both are affiliates of Al Qaeda, and have claimed responsibility for many of the most brutal atrocities committed during the war. Unlike the Free Syrian Army (FSA) and other rebel groups operating in the country, which are apparently made up mostly of native Syrians, Al-Nusra and ISIS include large proportions of foreign fighters. In fact, ISIS is the same group once known as Al-Qaeda in Iraq, and has been part of the insurgency in that country since soon after the Iraq War began in 2003. These two groups have emerged as the most powerful and effective fighting forces in Syria, and are responsible for many of the rebel victories over the last year and beyond. And although the Syrian rebels have rarely if ever been united under a single command, Al-Nusra and ISIS have increasingly stood out not only for their radicalism, but also for their direct conflict with the Free Syrian Army and other groups, often seizing towns from the other rebels by force. Now, enough information is finally available for us to show these groups separately on the territorial control map. 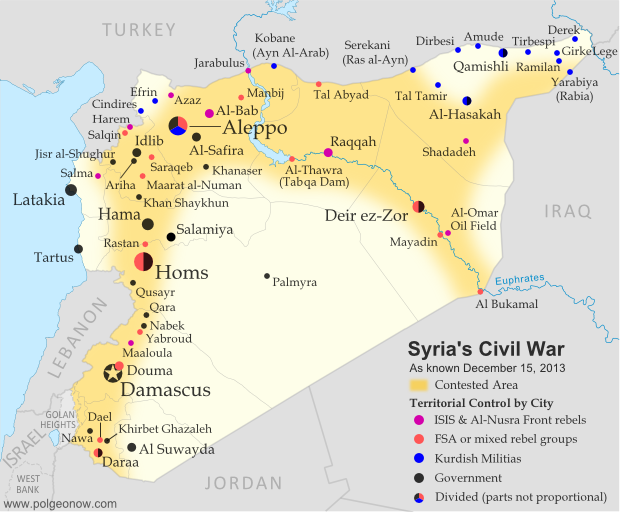 Although most rebel territory in Syria is still occupied by mixed rebel coalitions or FSA affiliates, several cities and towns are now known to be primarily under ISIS and/or Al-Nusra control. ISIS's area of control is mostly in the northwest, stretching from provincial capital Raqqah to key towns in Aleppo and Idlib provinces, and all the way to the far western rebel outpost of Salma in Latakia province. Al-Nusra, though present across most of the country, is especially known to control territory in the east, where it has held the oil town of Shadadeh for some months now. It has also recently captured the Al-Omar Oil Field, Syria's largest. Al-Nusra has made headlines in Western countries recently by repeatedly harassing and occupying the historic Christian town of Maaloula north of Damascus. The largest change in territorial control since our August Syria map update has been the army's recapture of Al-Safira, a satellite city of Aleppo which is also the location of a major chemical weapons stockpile. Rebels had captured the city early this year, but government forces took it back last month as part of a campaign to reopen the back road from Homs to Aleppo. The nearby town of Khanaser was recaptured one month earlier, after having fallen into rebel hands just after our last update in August. Ariha, an important town in the northwestern Idlib province, was also recaptured by government forces in early September, after switching back and forth in control more than once over the course of the war. Syria's capital city of Damascus has continued to be a focal point in the war, with rebel and government forces fighting fiercely for control of its many suburbs (map). Meanwhile, one of the most active fronts in recent weeks has been the area between Damascus and Homs, where the Syrian military and its ally Hezbollah from Lebanon have been trying hard to root rebels out from a mountainous region along the border. In addition to the Christian town of Maaloula mentioned earlier, rebel possessions in this region also include the town of Yabroud, with the government having captured Qara last month and Nabek just a week ago. The southern Syrian province of Daraa has continued to be a major front for fighting over the last several months, with a coalition of various rebel groups capturing the border crossing next to Daraa city in October. Meanwhile, in far northeastern Hasakah, Kurdish militias have seized the Yarabiya border crossing from a coalition of ISIS, Al-Nusra, and other groups. This is the main border crossing into Iraq from northern Syria, though the Kurdish National Council had previously set up a temporary crossing to the north. The area across this border is part of Iraq's official autonomous Kurdistan Region. Also in Kurdish-majority Hasakah province, this edition of the map has been adjusted to reflect the fact that the city of Al-Hasakah itself is apparently under partial Kurdish control.